Just because I could not find my writing mug this morning (the one I’ve used every single morning of my writing days — not my entire writing life — only those days (years) during which I’ve been writing my current WIP, even that really dark year when I thought it was all a big waste of time and it would never amount to anything, and I would never finish it, and what did it all MEAN after all, even that year — THAT mug. It’s gotten me through A LOT. So yeah, it’s nowhere. But I’m “ok.” Honestly. I’ll be “fine.” No, I do not think someone snuck into my house in the middle of the night and plucked it from my kitchen in an attempt to sabotage me! That’s a good one. Nor do I think Kathy Bates is sipping from it right now from the hall coat closet — the one with the light bulb that flickers on and off for no apparent reason. I wish! But where can it be and what does it mean? The universe is telling me something. But what? That I should become an alpaca farmer? Get my eyebrow pierced? Buy those boots that are not on sale at Lord&Taylor? I DON’T KNOW. But, what I do know is that this will not break me. I am going to march right back into that kitchen, make some coffee, and choose a random, generic mug from the–NO! I CAN’T! Yes, I can. I will “pull myself together” and do the thing that I do when a problem has burrowed its nasty little head into my day–Problem Solve! Listen, the truth is, even though it was MY WRITING MUG and I used it EVERY SINGLE MORNING of my writing days, some of those days I wrote some pretty awful stuff. Embarrassingly AWFUL. So what was it doing for me on those days? Seriously. What a lousy freakin’ writing mug. How pathetic. Now that I think about it, it’s never been about that mug. Am I right? How silly, really. A mug?! 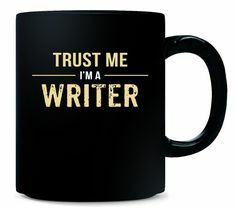 A mug is gonna somehow magically turn me into a writer?! I don’t think so! Everyone knows it is NOT ABOUT THE MUG!! That is utterly laughable. When was THAT gonna dawn on me?! I feel better already. It was NEVER about THE MUG. It’s always been the socks. Socks, I can believe, Eva. Hope you find your mug though, just in case. It’s not really the mug, Eva–just the caffeine which can produce some incredibly great writing. . . or not. Hope your mug eventually does turn up. It’s probably taking a Christmas break or even meeting up with my fave “troll pen” that produced some great writing. . .or not–and has been lost forever. . .